When the tide is moving Shark Reef turns into what could often be referred as "a River". 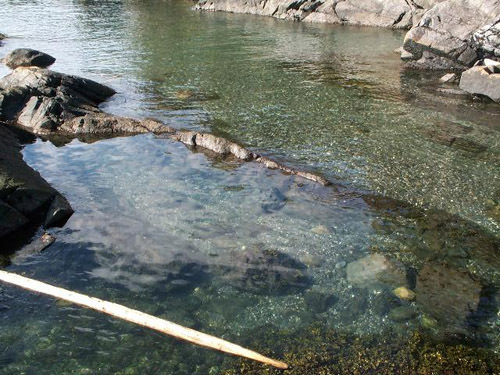 The water moves through Shark Reef so fast it carries drift wood through at about 10 mph. You can watch the rapids and whirlpools swirling through the channel. Even when there is no tide moving, there are still things to see and do. The Sea otters and Seals will come off the rocks, you can see them hunting for fish and being playful as they splash around in the water. When there isn't a tide, the near water can be extremely clear and enticing. The water can look clear enough to wade your feet in or take a swim, but only wade your legs or feet, even though it looks like there is no tide, you can still be pulled out to sea in an eye blink, so please do not try to go swimming even though it is so inviting. If you look over the trees above you can sometimes spot a perching eagle on one of the limbs. Across Shark Reef, on the near island, you can see the lighthouse on Cattle Point, San Juan Island. You will also see many boats crossing through since it is a major channel between Lopez and San Juan Island. Every now and then if you keep your eyes open upon the water, you will see porpoises, which are a northwest type of a dolphin. Sometimes Killer Whales will also make their way through. Before you leave, a must visit is Agate Beach, which is located roughly on the very southern part of the island. 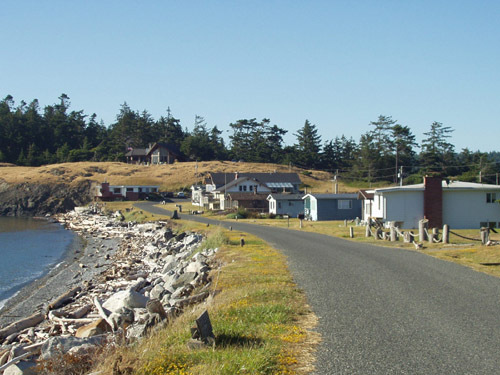 You will find Agate Beach on the south ending of Mud Bay Rd. When you arrive, you should be able to notice it with the long stretch of road just above the beach. Just to be sure you will see the sign in the picture, in front of Agate Beach, you can park your car in the designated parking areas and access it from the staircase.